Keeping our campus’ participants active and healthy, through golf, fitness, soccer, tennis, and yoga is our key goal. The innovative golf program started in 2013, in collaboration with The First Tee ® and PGA REACH. Infused with evidence-based practices for teaching golf to people with ASD, Ernie Els #GameON Autism Golf is designed to build self-esteem and confidence in a fun, welcoming and supportive environment; encouraging participants to learn golf skills while practicing specific autism learning concepts including communication, emotional regulation, motor, and social skills. 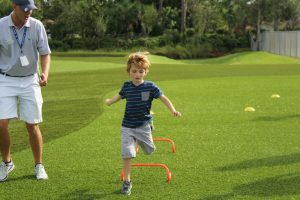 Participants will learn and practice foundational motor skills through fun athletic games and golf activities while practicing social/communication skills in each class. Ernie Els #GameOn Autism™ Golf manual is now available for instructors, schools, and other autism organizations to integrate into their own curriculum. Ernie Els #GameON Autism Golf Program is specially designed so that participants learn efficiently and practice effectively to achieve their individual golf successes. 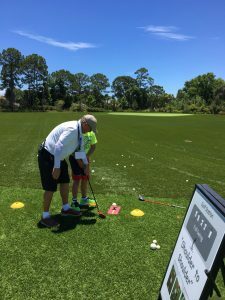 Ernie Els #GameOn Autism Golf Program is funded in part by the Florida Junior Golf Council. Ernie Els #GameON Autism Fitness is an innovative, family-supportive, research-based fitness and wellness program for individuals with autism spectrum disorder (ASD). It incorporates the use of traditional fitness equipment, as well as music, dance, and video games as a means of motivating student participation in fitness activities including cardiovascular, strength training, flexibility, and common recess games. Individuals with ASD often lack opportunities for physical activity due to high levels of intensive therapy involving stagnant activities throughout each day. In addition, many individuals with ASD have high incident deficits in motor planning and coordination leading to an aversion to organized sports activities. Although these individuals may shy away from physical activity and organized sports, it is imperative to create programs that use evidence-based practices to get them active, moving and practicing social skills. Individual and group classes are available. We are thankful for the $6,500 grant received from the Autism Services Grants Council to assist in funding this program as part of the Adult Services SALSA cooking class. Our soccer program was developed by Luis Gajardo of Pure Sports Foundation. This program is aimed at bringing a team sports to those on the spectrum, rather than an individualized sport, which targets children to work on coordination, communication and leadership skills. 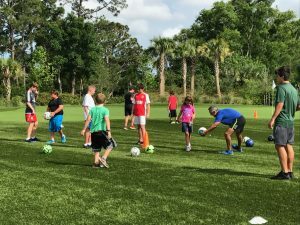 This project is geared towards including youth with disabilities in the community with nondisabled peers, coaches and travel soccer players to provide individualized attention to each player. 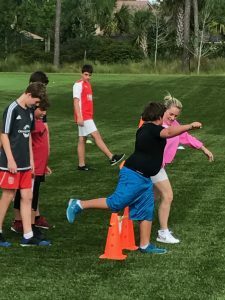 By creating this match between all those players, the youth on the spectrum are developing interpersonal relationships, motivation, and self- esteem which is supported by positive reinforcement. 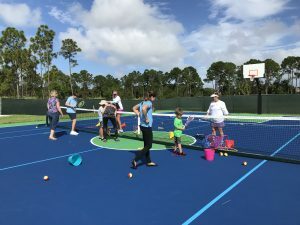 A structured tennis learning experience that includes: basic strokes, eye-hand coordination, racket handling; putting strokes together, and components of the game-based process. Games and rally ball included. Special needs Yoga/Fitness enhances stamina, flexibility, energy, and strength in a fun and motivating social environment. 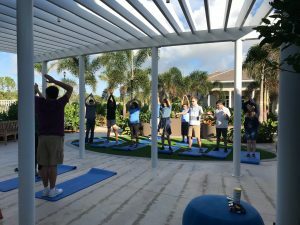 Classes include warm-ups, breathing exercise, cardio routines, developmentally appropriate yoga poses, and relaxation techniques while offering a full body experience of physical fitness and philosophical traditions of yoga. These programs do not provide aides or personal supports and require participants to engage in a 3:1 ratio. Those who accompany participants who need additional support will be required to actively participate in each practice session.